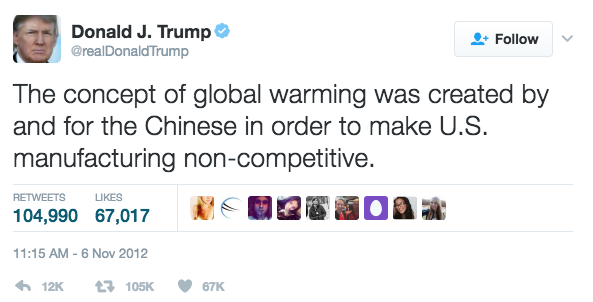 An overwhelming majority of the scientific community agrees that global warming is a real crisis, not a hoax created by the Chinese. According to the Intergovernmental Panel on Climate Change (IPCC), “it is extremely likely (95–100%) that human influence has been the dominant cause of the observed warming since the mid-20th century.” Human actions have been largely attributed to snow and ice melt, changes in the hydrological cycle, and sea level rise. Also stated by the IPCC, “Human influence has been detected in warming of the atmosphere and the ocean, in changes in the global water cycle, in reductions in snow and ice, in global mean sea level rise, and in changes in some climate extremes. It is extremely likely that human influence has been the dominant cause of the observed warming since the mid-20th century.”1 Evidence for climate change due to anthropogenic forcing has been recognized by scientists across the world, with the primary driver being the measured increase in atmospheric carbon dioxide from environmentally harmful processes including fossil fuel combustion. 2. The Keystone XL Pipeline will not harm the environment. The Keystone Pipeline, an oil pipeline system running between Canada and the United States, has just been approved by President Trump to advance the construction of an extended line called the Keystone XL. Barack Obama rejected the project last November, due to extensive proof that the disadvantages far outweigh the potential benefits. The Keystone XL would have harmful environmental impacts including a projected generation of over 22 billion tons of carbon pollution, which has been proven to exacerbate climate change (2). In addition to the emissions that will be caused by the pipeline extension Canada will be losing 54,000 square miles of untouched wilderness, which will cause significant loss of habitat, increase erosion, and reduce the amount of trees available to absorb atmospheric carbon (3). 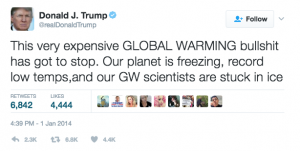 Walker, a senior adviser for President Trump, also stated that “over half the climatologists in the world doubt the influence of human activity on climate change”5. The latter statement has already been proven to be factually incorrect in the first scientifically disproven alternative fact, demonstrating Walker’s lack of credibility on the matter. 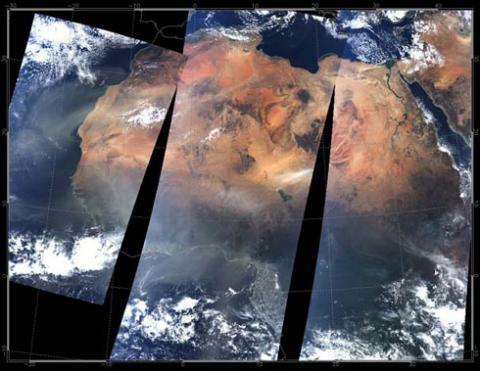 NASA’s Earth satellites have consistently proven to be an invaluable resource to humankind. They have repeatedly proven the reality of the climate change issue at stake with evidence of rising global temperatures, sea level, and greenhouse gas emissions. Removing the ability to track these environmental trends with human activity would also remove the ability to show the global harm caused by increased greenhouse gas emissions from projects such as the Keystone XL Pipeline. With Trump’s plan to reassign some Earth monitoring efforts to NOAA (National Oceanic and Atmospheric Administration) and NSF (National Science Foundation), who both have significantly smaller budgets, the performance of these critical satellites will diminish extensively. NOAA and NSF would not have the time, money, and resources to take on these extra duties to sufficiently track essential environmental changes that are rapidly occurring daily. By shutting down NASA’s Earth Science division, a wealth of environmental data that is currently being used to generate predictive models and identify long-term climate trends will greatly diminish. Even if Earth satellites launch in the future, under a different administration, the gap in data will be a severe setback for climate science with long-term impacts that can take decades to recover from. 4. Record temperature lows are a sign that climate change isn’t real. Rising global temperatures cannot be sensed by a human from day to day life. According to NASA, global mean temperatures have increased by 1.4° Fahrenheit since 1880, with most of this warming (2/3 of it) occurring since 19756. Temperatures fluctuate significantly due to natural cycles such as winter and the El Niño Southern Oscillation (ENSO), which drive temperature extremes to various parts of the world. Despite occurrences of cold weather, the global mean temperature is still rising at a nonlinear rate, as shown below. Additionally, the climate change crisis is not solely about warmer temperatures. Human activity has been related to changes in the hydrological cycle, atmospheric composition, frequency and intensity of climate phenomena such as ENSO and monsoons, and other key earth systems that impact global communities and ecosystems (1). 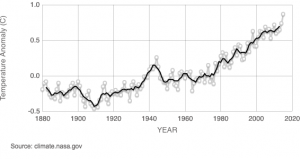 Global Surface Temperature since 1884, with the 10 warmest years occurring since 2000 (3). 5. We cannot conclusively say how much human activity is interfering with the climate. With only 5% of climate scientists denying the existence of sufficient proof to link human activity as the primary cause of climate change, Pruitt’s statement of the debate behind climate change is misleading. The overwhelming majority of climate experts are not debating this issue. However, since Pruitt’s argument is based on the fact that 100% of climate scientists are not in agreement over the extent of human activity on the climate, he is emphasizing the need for further research on the topic to be conducted in order to produce more conclusive findings. If the 95% of climate scientists who agree that climate change is a real global crisis, then conclusive findings are necessary to protect the homes and health of both our generation and the next. Climate change has significant potential to threaten future existence of coastal communities, stability of ecosystems all over the world, and the health of the 7.5 billion people inhabiting the planet.